On a recent business trip to London (to coincide with the marvellous Manet exhibition) I had some ‘extra’ hours and decided to visit the Bethnal Green Museum of Childhood. My notebook was at the ready as I was hoping for some treasure to hoard for later use or even a prompt for something new. I didn’t expect a trigger for a personal memoir on writing implements. 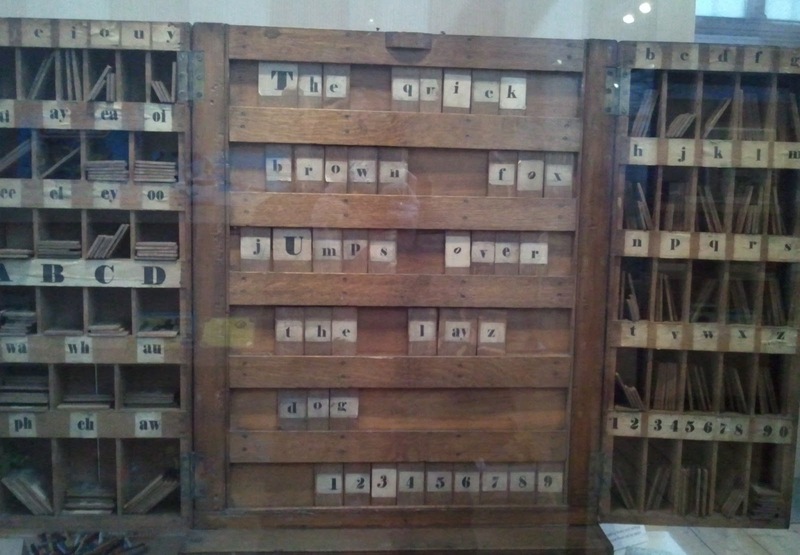 This fascinating letter cabinet definitely pre-dates anything in my experience but was worth the photograph. There it was. In front of me in a glass case, a toy that I’d completely forgotten about owning. The jolt of recognition was like a physical blow – so much that I reached out and touched the glass case with the palm of my hand. How could I have forgotten owning this? Memories flooding back. The delightful chaos of our big family room. The red coals of the fire. The socks hung over the black and gold fireguard. The smell of cinnamon, the sound of the radio and a bunch of noisy children with various assorted relatives. Amid the hubbub I find a quiet corner to sit down and open up this perfectly amazing gift, wondering how Santa Claus knew I wanted this when I didn’t know myself. There was paper in place and the ribbon was slotted through, ready to go. The smell of fresh ink is in the air around me, the achingly new and shiny metal cool and precise under my fingers. Of course the keys were only pretend, painted on. 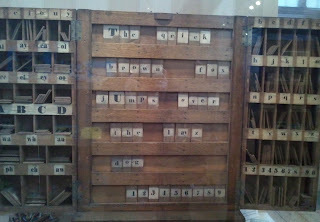 And it was a complete fiddle having to find a letter by turning the central dial and then press the bar below every time to imprint each letter singly on the paper. But the result was real! Actual type appeared as I worked up a speed. I was writing stories in a proper grown-up way! 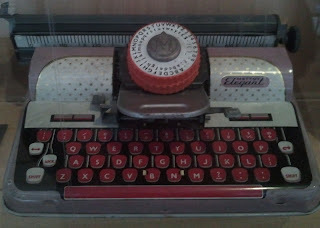 When I actually became a grown up my next typewriter wasn’t much better. Spotted on a skip, having been thrown out of a school business studies department, it had the tops of some crucial keys missing. My husband delved deeper and found another machine which we cannibalised for spare keys. These key tops (the less used x, y and z ) were not the letters I needed, but at least I could use them to cover the ones missing from the first one. Then I had a brilliant idea. I used the tiny brush from a bottle of tippex to paint on top of these duplicate lettered keys the correct letter they were now linked to – ingenious, eh? However, as I typed with the machine the tippex came off, smearing my fingers in white blobs and leaving me forever bamboozled as to the exact layout of the Qwerty Keyboard. I did type my first book on this machine. My husband claims that’s how I got it accepted, as I thought I was typing completely different words from what were actually appearing on the paper! Things have continued in a similar vein in my writing life. I’ve had bouts of RSI and, when I inadvertently ‘hosed’ my ergo keyboard with a cup of chamomile tea thus rendering it useless, I had trouble finding a suitable replacement. Eventually I ordered one from the USA. But my computer is wired UK style, so now when I want double speech marks I have learned to press the @ which is located above the number 2 on my US keyboard, and vice versa (sort of) The hash tag eluded me for weeks. I still haven’t found where the tilde is hiding, yet…. P.S. I loved Bethnal Green Museum, although I didn’t have time to see half the exhibits. Added bonuses were a café with good food and friendly staff. I’m guessing most HGs have been there, but if not, then maybe a future outing? The Traveller (from dyslexia friendly publisher Barrington Stoke) is out in March. Divided City Playscript now available. How gorgeous! I have never been to the museum, but now I must! What a lovely post, Theresa! Definitely like the sound of a visit here! I've never been either - though did recently visit Pollock's Toy Museum (somewhere in the Bloomsbury area) also full of toys that triggered memories. 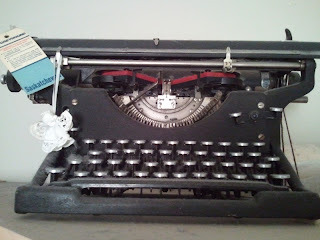 I loved my first typewriter, an old Underwood, given to me by my parents with a ream of paper on my 14th birthday. Theresa, did you mean to say "Query Keyboard"? It seemed very appropriate in the circumstances? Ouch! No Ann, I didn't mean to say 'Query Keyboard' I've now been brave enough to go in and edit my own post to change it, but it does seem appropriate, doesn't it? I think it's my brain that's wired wonky! I remember typing class with thumpy classical music to follow the beat of and those steep-racked manual typewriters - how hard you had to hit the keys and how many times my fingers slid between and got scraped! Past the toy stage, but a vivid memory none the less! Katherine and Sue - it really is a lovely spacious museum with an interesting history of it's own, minutes from the Tube, and lots of events going on. I joined in the Interactive Storytelling - it was brilliant. It is a beast of typewriter Joan but I can't bear to throw it out. And yes my fingers were so sore in those early days of writing. I think a contributory factor to my RSI is that I still hit the computer keys very hard although that's not necessary. We used to type to music too when I was at school! I'd forgotten that. Our teacher told us not to hit the keys hard or we'd never build up speed. I took that to heart - but when I looked down at my first lines of type there was nothing there at all! I miss the raked keyboards. My new one is propped up on books; this reduces the number of typos a bit. Lovely post, Theresa and if I am responsible for your upcoming love affair with an Ipad, I'll be very pleased! And yes, Bethnal Green Museum is a must! Thanks for a super post! Ann I never thought of the significance of a raked keyboard before! I have mine propped up too for ease on wrists but I didn't make the link to the manual typewriter. I do find having a 'split' in the middle so that there's a space between the T&Y G&H etc a huge help to ease wrist and shoulder aches. Thanks Adèle - I'll let you know how my I-padding goes! 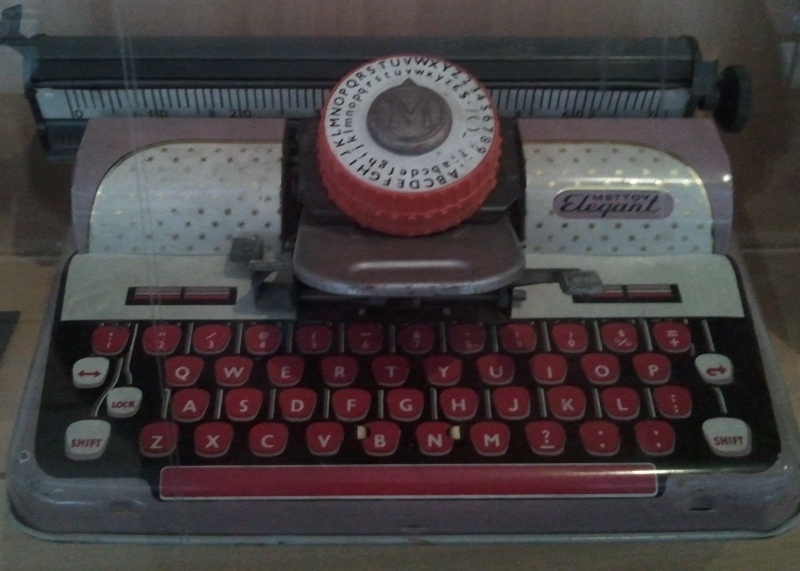 I then graduated to an old office typewriter then but I wrote my first stories (all rejected) on an Olivetti portable typewriter which I thought was the bee's knees. Gosh now you've stirred another memory for me Sally! One of my older sisters got an Olivetti portable and I remember being v. jealous of how cool she looked typing away on it. Thanks for the comment.